WASHINGTON — Presiding over a hearing of the House subcommittee on Railroads, Pipelines and Hazardous Materials on Sept. 13, Rep. Jeff Denham took a moment to send off the subpanel’s outgoing ranking member, Rep. Mike Capuano (D-Mass.). Removing his jacket to reveal a white, short-sleeve business shirt — Capuano’s trademark look — Denham (R-Calif.) quipped that he had learned to appreciate the “cooling effect” of the wardrobe choice, a gentle jibe that elicited laughter from committee members. Presiding over a Highways and Transit Subcommittee hearing a week earlier, Rep. Sam Graves (R-Mo.) delivered opening remarks in a level tone and introduced colleagues and witnesses with military precision. When Rep. Brenda Lawrence (D-Mich), the last member to question the witnesses, joked about flying cars, Graves did not break. “Seeing that there are no other further questions, I’d like to thank each of our witnesses for your testimony today,” Graves said, concluding the hearing. 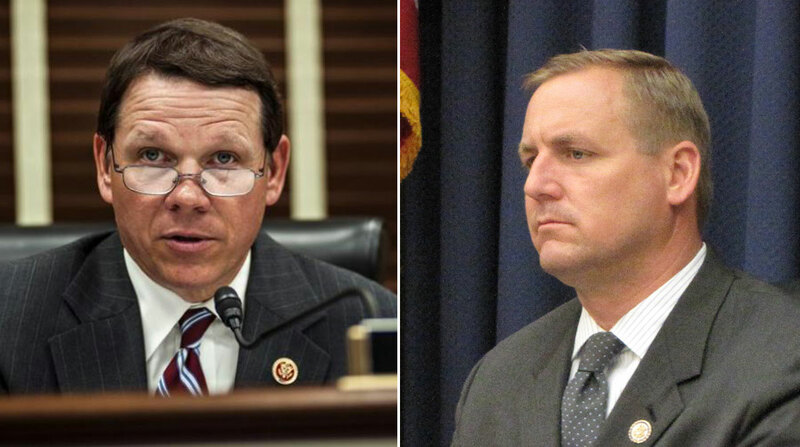 Should Republicans retain control of the House after the midterm elections, they’ll have a choice between these two men — and their differing styles — to lead the Transportation and Infrastructure Committee. Both are interested in replacing outgoing Chairman Bill Shuster (R-Pa.) and both in separate interviews last month with Transport Topics pledged if chosen to deliver for Republicans and President Donald Trump a long-awaited, long-term infrastructure bill. Graves sits for an interview in his office. “My biggest strength and my greatest weakness is that I am — my colleagues will tell you — that I am a hard-charger,” said Denham, who was elected in 2010. “I work hard. If I take an issue on, we’re going to see it through.” He lists water infrastructure and railroad policy updates he has helped advance among his success. According to both men, early next year Trump will ask Congress for an infrastructure bill that would fund bridge repairs, improve freight connectivity and help people connect with employment nationwide. Still unclear is how to pay for those improvements. My biggest strength and my greatest weakness is that I am ... a hard-charger. Dedicated truck lanes connecting urban and rural areas is one proposal he would advance. “You’ve got to be able to get freight moving efficiently from our ports and our big cities back to our rural areas, and having dedicated truck lanes will not only create the safer driving experience for all of the other commuter lanes but will create efficiencies for the truck drivers as well,” Denham said. Graves has an all-options-on-the-table mindset but believes VMT would help fund large projects and also bolster the depleting Highway Trust Fund account. “We’re going to have to deal with that before the next highway bill, which is right around the corner: 2020,” Graves said. I grew up in Missouri, which is the crossroads of everything transportation. Both men believe they can navigate Washington’s politically volatile environment to get it done. Besides infrastructure, both lawmakers would prioritize trucking and autonomous policies. For instance, each would continue to pursue nationwide uniformity on meal and rest break rules for truckers. “We want professional drivers to be able to pull over in a rest area or a truck stop when they feel is the right time to take a break,” Denham said. Both say the ever-changing autonomous landscape is pressuring policymakers to catch-up. Once leadership announces the next chairman, Denham and Graves assured their collegiality would endure. If Democrats win control of the House, however, Rep. Peter DeFazio (D-Ore.), the Transportation and Infrastructure Committee ranking member, most likely will take over. Denham and Graves praised DeFazio’s leadership as well as his commitment to bipartisanship.